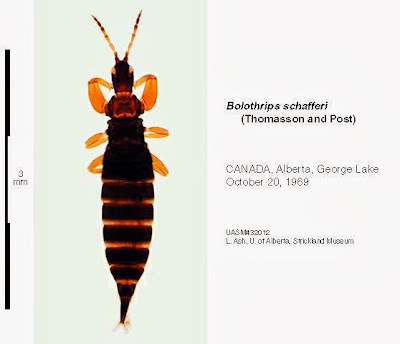 Bolothrips schaferi, from University of Alberta. 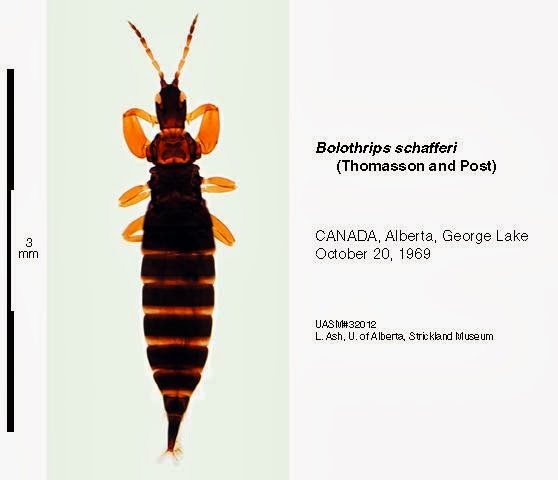 Bolothrips is a genus of grass-living thrips found in the Holarctic and Africa. Characters (from Mound & Palmer 1983): Antennal segment III with one or two sense-cones, segment IV with two or three slender sense-cones. 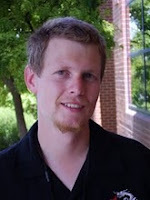 Eyes may or may not be prolonged ventrally. Maxillary stylets wide apart in head. Metathoracic sternopleural sutures present or absent. Pelta broadly rounded. Abdominal tergites each with one pair of wing-retaining setae.